I love love love how they carefully package the products into the shipping box! My parcel arrived in a hot pink wrapping envelope and when I tore it open (due to the excitement) I found even the box inside was securely wrapped in a bubble wrap. Althea Korea box is nicely designed so it's useful for reuse! Inside of the box were individually wrapped products placed in between crumpled pink coloured papers! Even the invoice was printed on a lovely paper. I've had experiences with a lot of online shopping website and I really have to say there were never any other sites I've ordered from previously that individually bubble wrapped products before. Usually they just wrap them altogether in one big bunch of bubble wrap and that usually ruin the product packaging, or some just don't bother to wrap and just placed straight in the box. 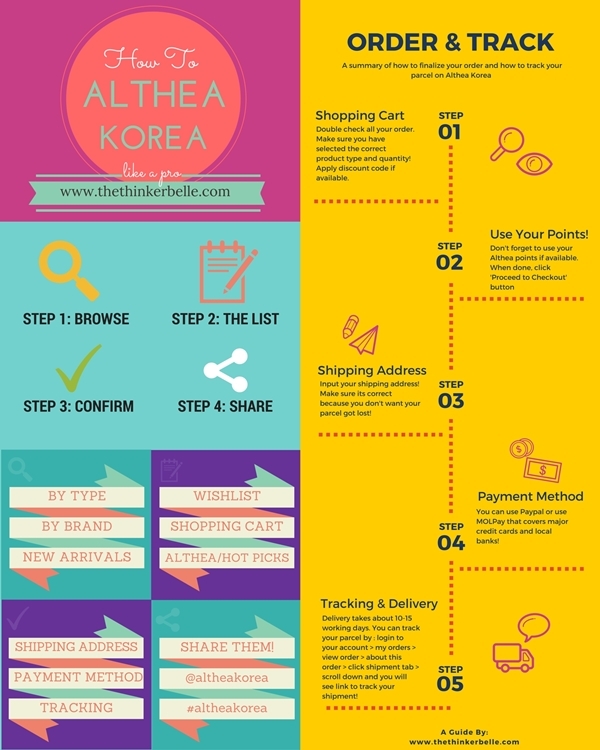 You can also check out my post on '5 Reasons Why You Should Choose Althea Korea'! But I'm not responsible if you overspend because I won't be able to stop myself either. If you need more info on tracking your parcel, Tammy from plusizekitten.com made a complete guide on how to track them so you can click on the link HERE to read more. I love Korean beauty products so much and I've been dreaming about this kind of online shopping site for so long! Finally we have it! Thanks for the guidelines and other Butterflies' posts regarding Althea.kr are so much fun to read as well. The infographic is nice! Thanks! I'm gonna shop from Althea again this month!! Thank you dear :) And yes I think I will be shopping too sooner or later. The stuffs in there are so tempting!